In the very first calendar interface there is the generally important overview calendar put in the left under corner. 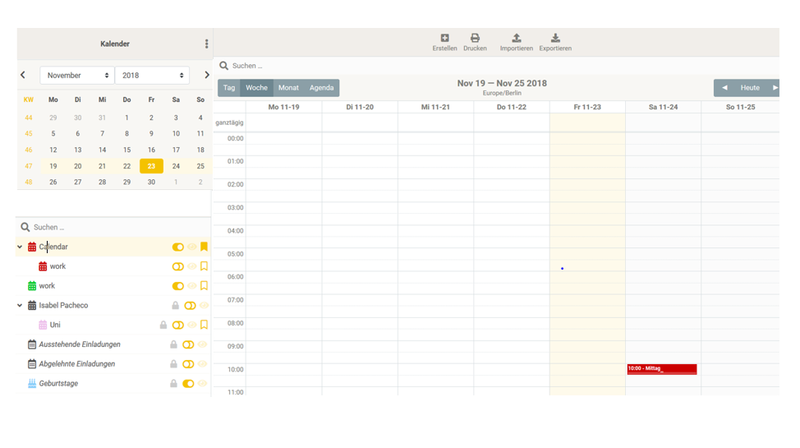 In the left upper corner there is a search field and a list of calendars. Look at the very first interface of the calendar. the overview calender is more used than the searching for a particular calendar, but at a less central location. the overview calendar is more central located. It switches place with the list of calendars (+search fields). bohlender moved this task from Backlog to In Progress on the UX Seminar WS17 board. @M.Gruber can you make a simple mockup (edited screenshot) that shows what you want? That's what we've had in the old skin. However, this way the menu button location might not be perfect.